Ani Safavi always had a passion for food and how foods go together. In high school, she was always looking at cookbooks and recipes in magazines, not fashion magazines, like many friends. Ani fondly remembers her working mothers warm Persian dishes of Polo and Khoresh (rice and sauces) hot from the stove. Her mother always had time for the family, filling their life with fun, car trips, and warm parties. Ani, like her mother, enjoys cooking. She always felt that she would do well if she opened a restaurant. 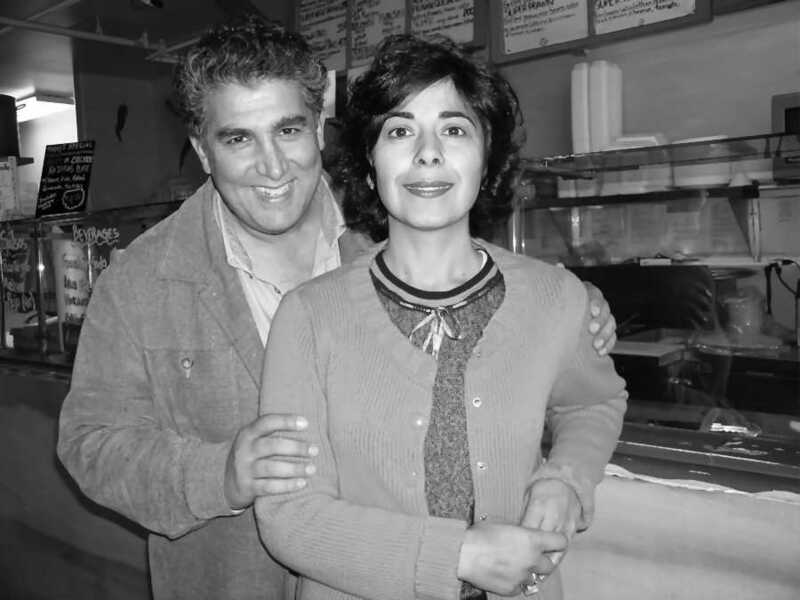 Now, together with her husband Paul, she has two -- Pommards Deli and the newest one, Como Esta Taqueria. Ani was born in a small town, Ahvaz, in Iran and raised in Tehran. She is the middle child in her family and has a brother and sister. Her family came to the US in 1970 from Tehran, where her father was an architect. He came first, leaving her mother to sell their home and to prepare to leave. In the US, her father became a real estate agent. Eventually all family members would turn to real estate. Even her sister who lives in Italy! In 1989 Ani not only got her own real estate license, but she also graduated from San Francisco State and married Paul. Paul was also born in Iran to a traditional Persian family who barely got out of the country during the height of the revolution in 1978. But Paul came before 1978. It was a popular tradition for children to go abroad for their education, staying with relatives. Paul started at a private high school in Potomac, Maryland. In the early 1970s, during the time he attended high school in Sunnyvale, his parents purchased a house in Los Altos Hills. Paul and Ani met at a party in SF in 1982. Paul was Ani's first Persian friend in the US and Paul re-introduced Ani to Persian culture and people. Today they speak Farsi at home and to their son, Cyrus. Ani and Paul are both multi-lingual, easily slipping from one language to another. Ani can speak Farsi, Spanish, Italian, and English, of course. Ani and Paul's pride and joy is their son 6 year old son Cyrus; they enjoy spending time together with him! Ani's other interests include photography, travel and animals. Several of her favorite travel photos decorate the walls of Pommard's restaurant. Ani has always lived with animals. Her extended family includes one dog, two cats and a parrot. Ani also volunteers for CASA, an organization that supports abused and neglected children. Paul's passion is exotic cars. He proudly owns a 514 TR - of course - Ferrari. After 25 years of marriage, Ani is a testimony to how well husbands and wives can work together and laugh about the challenges.